We rented this villa in late June and it really was incredible. There is huge attention to detail and everything you need is provided. The views are spectacular and it's far enough away from Elounda to not be bothered by the nightlife, but close enough to be convenient. The villa is very private, even from the Black Pearl next door, yet you can see it from everywhere in Elounda, as it occupies one of the highest plots. The accommodation is expansive - 4 bedrooms, with the downstairs bedroom being more of a self contained studio. The downstairs bedroom has no views, but is perfect for making a playroom. The gym is also downstairs and well equipped. The other bedrooms all have amazing views. Things to be aware of: Mozzies and strange biting insects are a problem in Elounda as a whole, so come prepared for that. Also the drive up to the villa's is very steep - our car needed a running start in first gear to make it up all the way, but you soon get the hang of that. We liked it so much we might make it an annual trip! 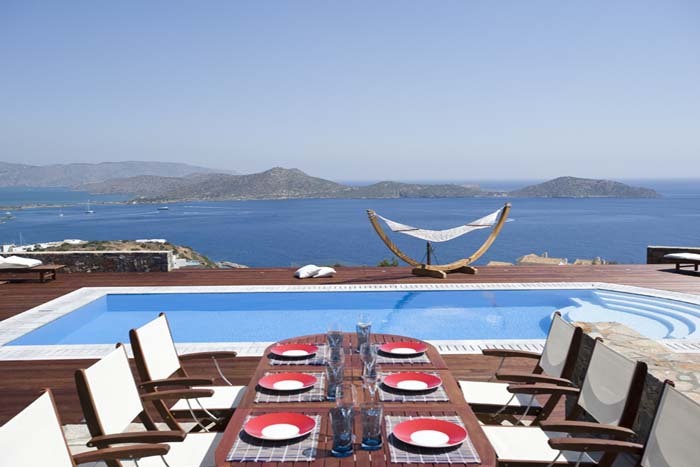 The villa was set on the hill top with fantastic views of the gorgeous blue sea and Elounda Bay. The villa itself is beautiful, very modern, clean, well maintained and well equipped. Rooms are comfortable and everything very carefully and thoughtfully provided. The pool was a good size surrounded by excellent furniture, sun loungers, comfy outdoor sofas and chairs. Very friendly and willing owner of the Villa, made his efforts to fill our holidays with wonderful memories. Car is definitely required to get to the villa and the nearby towns/ villages.